Local Search | ASTRALCOM - Content Strategy, Conversion Marketing and Customer Acquisition. 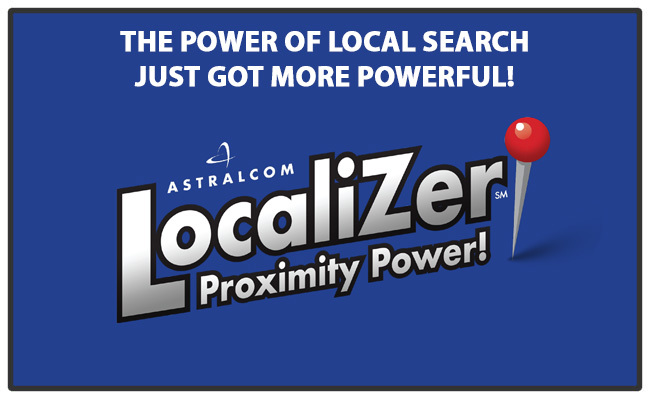 With LocaliZerSM from ASTRALCOM, you’ll have an “always on” local marketing presence. Whether searched from a mobile device, a tablet, desktop, or car GPS, you’ll be in front of all local customers, no matter where, or when they look. Because we’re search engine optimization (SEO) experts, we know the right combination of destination, 3rd party and content aggregator websites that help to create local search results. The quickest way to grow your business by reaching more local customers, more consistently, starts at $1,500.00/month. *One-time fee. Includes complete listings setup and content placement, where applicable. Offer is not a guarantee of placement and is subject to change at any time. Logos and trademarks are the property of their respective owners.